These fender systems are composed of individual elements of rubber that allow combinations between them. The system have a polyethylene facing pad (UHMW) solely or through a steel metal panel (open or closed and sealed configurations covered with plates of polyethylene which thickness is not necessary be so high. In both cases there is a low coefficient of friction with the ship’s hull due to the polyethylene. In the case of metal shield, the system can also incorporate chains, shackles and turnbuckles depending on needs. It can be installed on the dock horizontally or vertically and may consist of two or more rubber modules in either direction or combination of both. The maximum deformation capacity is 57%. 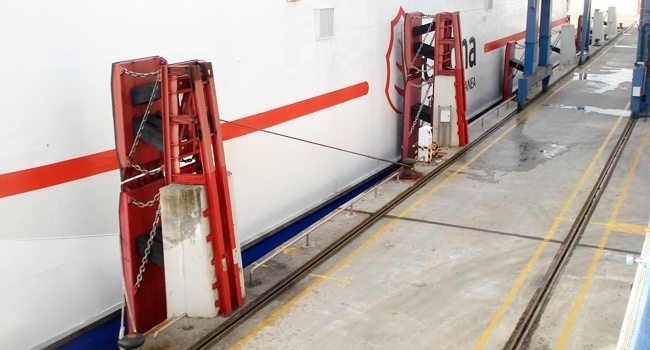 The use of these fenders has wide and varied applications in all types of docks.